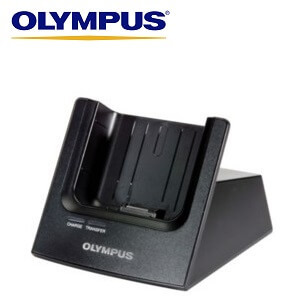 The Olympus CR-10 docking station (cradle) is for the Olympus DS-5000, DS-3400, DS-2400 and DS-2500 digital dictaphones. The well-designed docking station sits on the desk and snugly fits an Olympus digital dictaphone. The docking station allows the dictaphone to connect to your computer via a USB cable, so you can download your dictation files quickly and easily. Please note: this cradle does NOT come with a USB cable. If you require the cable also, you must purchase the KP-21 USB cable separately. NOTE: This cradle does NOT come with a USB cable. If you require the cable also, you must purchase the KP-21 USB cable separately.